In order to nourish nearly 10 billion people by 2050, we need to collectively consume more sustainable diets – patterns of eating that promote human health, food security, social justice, cultural diversity, and environmental and economic well-being for present and future generations. A sustainable food system ensures a universal right to food, meaning that everyone has access to sufficient, affordable, culturally-appropriate, and nutritious food. Sustainable food, in turn, is food that is produced, processed, and consumed with consideration for the human and natural environment and the labor that produces it with respect for food-related cultural traditions and preferences. By choosing to consume sustainable foods we can all have a positive impact on biodiversity, humankind, the natural environment, and the economy. VER-EAT!-TAS is here to help! While we oft­en receive messages about how our food choices affect our health and taste buds, we rarely receive information about the environmental, social, and ethical implications of our choices. 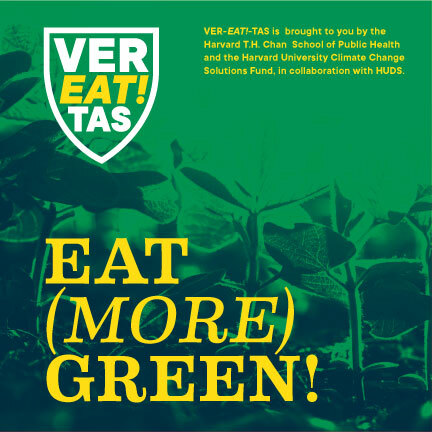 The goal of VER-EAT!-TAS is to provide greater transparency about the food choices we make on campus every day. EAT (MORE) GREEN TO MINIMIZE YOUR ENVIRONMENTAL FOODPRINT! One way we can eat more sustainably is to choose foods with lower environmental footprints. While everything we eat has an impact on the environment, some foods require more natural resources and produce more greenhouse gases than others. In a spring 2018 survey, 85% of Harvard students reported feeling concerned about carbon emissions caused by food production. 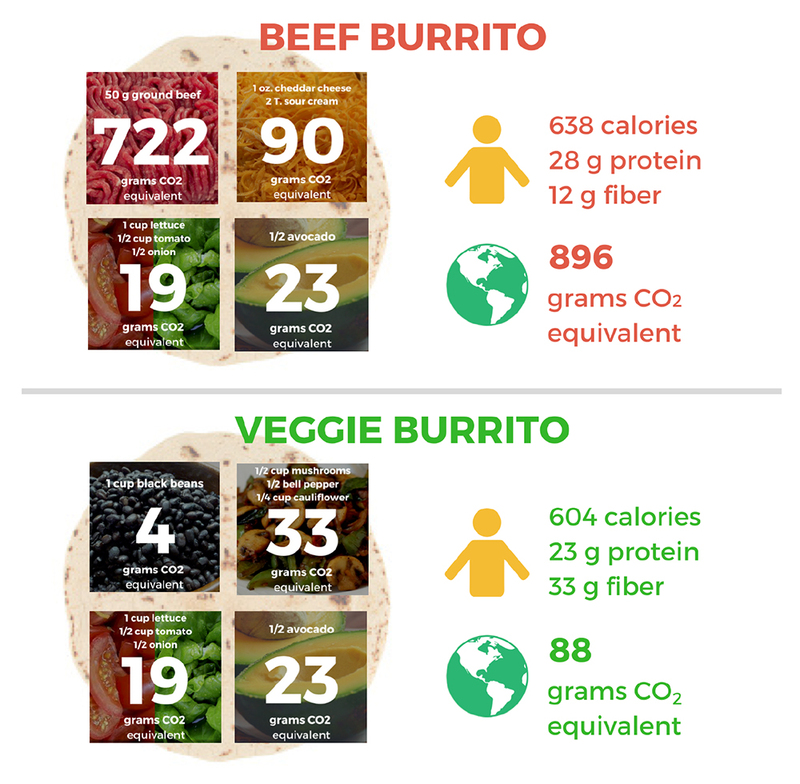 In response, to help inform you about the environmental impact of different foods, researchers at HSPH have calculated the carbon, nitrogen, and water foodprint of a standard serving of each of HUDS’ menu items and assigned them to one of three categories: high, medium, or low impact. You can learn more about the methodology behind the new labels HERE. For a detailed list comparing different foods’ energy and carbon footprints, see Table S4 (pg. 14) from Heller et al. 2018. To calculate your own foodprint, click HERE and click on the food (apple) icon. Food Climate Research Network: What is a Healthy, Sustainable Diet? VER-EAT!-TAS is brought to you by the Harvard T.H. Chan School of Public Health and the Harvard University Climate Change Solutions Fund, in collaboration with HUDS.